Christmas is fast approaching, and maybe one of my fabulous magic workshops may be an ideal early gift for a loved one? Well, here I have the cure for all your ailments. 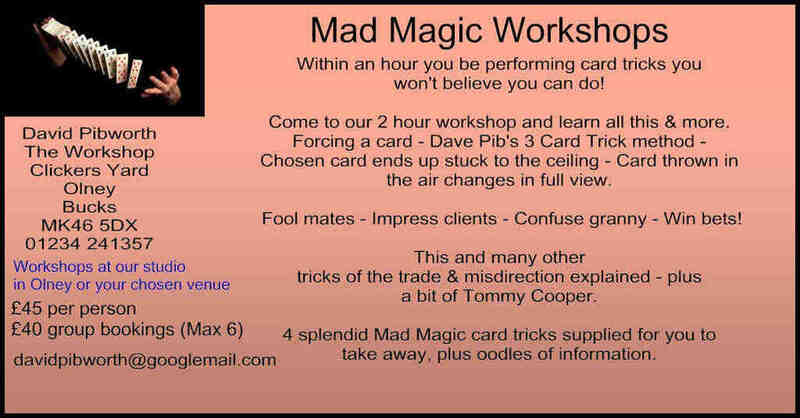 Not only do I sell magic tricks and gags, but I run workshops too! Either at my studio in Olney, or at a venue of your choice. All the magic I teach at these workshops is specifically devised for quick and easy learning and you'll walk away being able to do at least 4 gags immediately, which we supply as part of the workshop. So who comes on them? Well, all sorts of people really. At present, we're running them for some retired folk who just like to do it as a hobby. I'm tripping around to various schools as well and today I'm doing a talk on it to a group called Probus at the Carlton House Club in Olney. October and November are great months for me to workshop with people, as once we get to the start of December, I'm off in Panto as an Ugly Sister in Cinderella which is a standard gig for me each year. I pair up with the same partner each year, Phil Hoyles, and we do our stint as Uglies and it's always great fun. This year we're at Haverhill Arts Centre, with Janey Lee Grace from Radio 2 as the Fairy Godmother and I'm also directing it. Phil and I rehearse on Skype as he lives in Kent and then we all meet up in December, rehearse for a short period and perform for a couple of weeks which takes us into the new year. But before all that, I am available, so just ring me on 01234 241357 if you are interested in my Magic Workshops. See the video above for a rundown. It's all great fun. Yeah, yeah, I know, it's only October, but really, someone had to be first to mention Christmas!